(NaturalNews) Mass-produced man-made chemicals that mimic estrogen should be a major concern for humanity, as they can go undetected in water and affect the reproduction and gender identity of various life forms. Lurking in the water, these chemicals can be taken in invisibly by all sorts of life and disrupt the endocrine system. Environmental studies in Virginia and Pennsylvania waterways show that these synthetic estrogens do more than just affect the endocrine system. These estrogen chemicals can also affect fish heart development. "Any relevance to fish or humans is potential, not actual, because the untested hypothesis is exactly that: untested," said lead author Dan Gorelick. The study is the first of its kind to show how these chemicals in the water attach to proteins that control how heart valves grow in fish. U.S. Geological Survey research biologist Luke Iwanowicz says, "This tells us that endocrine-disrupting chemicals could lead to improper heart development. We were quite surprised since this is something that others hadn't observed before." In the investigation, the team of researchers exposed zebrafish embryos to water samples taken at 19 sites at four different waterways -- the Allegheny, Shenadoah, Susquehanna and Delaware watersheds. The watersheds were apparently teeming with estrogen-mimicking chemicals. Sixteen of the 19 sites quickly triggered estrogen receptor proteins in the zebrafish. The receptors, now triggered by the chemicals, can attach to DNA and turn certain genes on or off. This activity is typically witnessed in the liver, but in this experiment, the researchers saw DNA changes due to estrogenic activity in the fish's heart valves. The chemicals, which were never isolated in this experiment, were pervasive in 16 out of 19 water samples. This goes to show that the DNA of life is now under perpetual attack by polluted water. Genes may be turned on or off due to environmental factors that humans caused. Which chemicals create this estrogen-infused water? Some pesticides mimic estrogen. These are applied universally throughout the land and infiltrate the soil and groundwater. Another perpetrator is bisphenol A, which is the plasticizer found in the lining of many canned food items, plastic bottles and dental sealants. Birth control pill hormones, to be doled out for free under Affordable Care Act mandates, are another estrogen-mimicking hormone consumed en masse and pissed back into the environment. There are "literally thousands of chemicals in the water at low concentrations," said Gorelick. Referring to how these synthetic estrogens affect heart development, Gorelick says, "We don't know yet in this case what's in the water, what the bioactive ingredient is." The zebrafish in this study were examined through a special kind of test that turns receptors fluorescent green when they are activated. When the fish were given this water, the researchers saw their estrogen receptors light up, activated. Sterile lab water was mixed into the various water samples to dilute the chemicals. 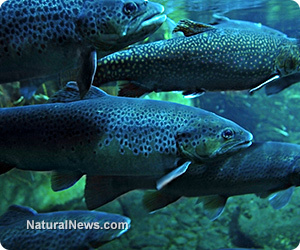 When water samples were heavily diluted, one part river water to 4,000 parts sterile water, only five of the samples activated the estrogen receptors in the fish. Regarding the study, Environmental Health News reported, "Hormone-like chemicals often do not act in a typical way; they can have health effects at low doses but no effects or different effects at high doses." The American Chemistry Council, a representative arm for chemical manufacturers, think the findings show very little and are not meaningful, pointing out that natural estrogens like soy could also be causing the receptors to activate. Furthermore, the receptors in humans are different than fish, as pointed out by National Institutes of Health scientist Ken Korach. Synthetic estrogen compounds, which alter gene expression, have been found to cause reproductive problems and bizarre mating habits in wildlife. Could enough environmental factors change the biochemistry and reproductive potential of humans? Why are men and women experimenting more today with their gender identity than ever before? In one mind-blowing study, birth control pills were added to a Canadian lake to study their effects on male fathead minnows in Ontario. The entire species in the pond feminized and went extinct after a seven-year study. The study of epigenetics and the effects of estrogen-mimicking chemicals on life are important for the survival of life. How might these same endocrine-disrupting chemicals work not only in the liver but also in the heart and in other areas like the brain? More research will definitely be on its way in the years ahead.